[When I was much younger and dating women, I remember how Liberal the women in South Africa were. The slightest hint of pro-conservatism was something they looked down on – never mind, even the thought of being a NAZI! Even now, large numbers of white women in South Africa are still Liberal and would not want to be seen to be slightly racist in any way because it carries such a "social stigma”. Well, the GREAT NEWS is that some women are changing. I spotted this tweet on Twitter. Then I lost it because so many tweets were coming past. So I went hunting for it and found it. 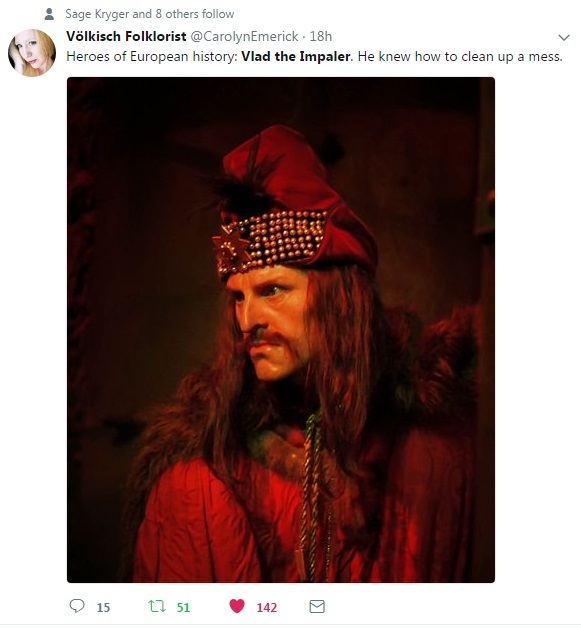 Vlad the Impaler fought Muslim Arabs who were invading Europe. At a point he took something like 20,000 of them and had them impaled on stakes. What he tried was to foment great terror. For the record, the terror did not really work and he lost in the end. But it was probably one of the most gruesome acts carried out by a white army since the time of the Romans when they crucified about 10-15,000 slaves along their main roads during a slave revolt.